Western blot analysis using lysates from MEF WT and MEF/PSEN1 (-/-) cells. The MEF WT lysates are positive for the protein Presenilin 1. 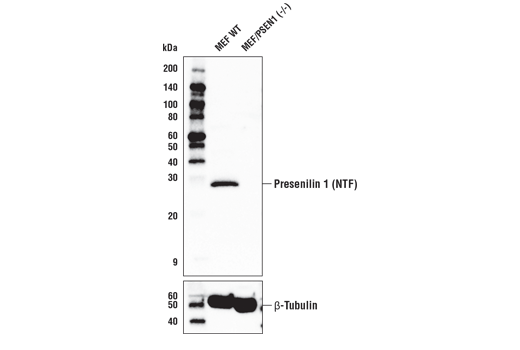 As expected, MEF/PSEN1 KO cells are negative for the Presenilin 1 protein (upper). β-Tubulin (D2N5G) Rabbit mAb #15115 was used as a control (lower). Wildtype MEF and Presenilin 1 (-/-) MEF cells were kindly provided by Dr. Bart De Strooper, K.U. Leuven, Belgium. Presenilin 1 (E3L9X) Rabbit mAb recognizes endogenous levels of the Presenilin 1 protein. Monoclonal antibody is produced by immunizing animals with a synthetic peptide corresponding to residues at the amino terminus of the human Presenilin 1 protein. Presenilin 1 and presenilin 2 are transmembrane proteins belonging to the presenilin family. Mutation of presenilin genes has been linked to early onset of Alzheimer disease, probably due to presenilin's associated γ-secretase activity for amyloid-β protein processing (1,2). Endogenous presenilin mainly exists in a heterodimeric complex formed from the endoproteolytically processed amino-terminal (34 kDa) and carboxy-terminal (~20, 22, 23 kDa) fragments (CTF) (2,3). Haass, C. and De Strooper, B. (1999) Science 286, 916-9. Kimberly, W.T. et al. (2000) J. Biol. Chem. 275, 3173-3178. Kim, T.W. et al. (1997) J. Biol. Chem. 272, 11006-11010.